The Eighth Story. Nineteen Years Later.Based on an original new story by J.K. Rowling, Jack Thorne and John Tiffany, a new play by Jack Thorne, Harry Potter and the Cursed Child is the eighth story in the Harry Potter series and the first official Harry Potter story to be presented on stage. The play will receive its world premiere in London’s West End on July 30, 2016. It was always difficult being Harry Potter and it isn’t much easier now that he is an overworked employee of the Ministry of Magic, a husband and father of three school-age children.While Harry grapples with a past that refuses to stay where it belongs, his youngest son Albus must struggle with the weight of a family legacy he never wanted. As past and present fuse ominously, both father and son learn the uncomfortable truth: sometimes, darkness comes from unexpected places. Hmmmm...I am left a little frazzled after this book. On the one hard there are some absolutely breathtaking scenes that left me in an emotional state of tears and on the other hand this really felt so disjointed and off from the beloved series that we have read over and over again. These sons of Malfoy and Potter are just amazingly depicted and heartbreaking to read about. I loved ever moment they were on page. Their relationship with each other and the relationships they have with their parents kinda tore me up. Of the original characters, I found him to be the one I most enjoyed reading about. His current life and loves and the reflections his character has on the past were a bit gut wrenching to the point my daughter asked me why I was crying and I could hardly form a sentence to explain what was happening. Yes...Snape. And I will not go into much detail but the scenes with this beloved character is reason enough to read this. Harry kinda drove me nuts at times and I am not sure we really got full closure on what the riff was with him. The whole plot was OTT and just a mess. Yes, you will need a pen and paper to keep up and honestly even that will not help. I mean, even in Back to the Future II we got a map...but nothing here even came close to being resolvable...so I guess just role with it and don't worry so much about the details. I am not sure I even know who this was. Hmmmm. Harry, Voldemort, Albus, Scorpius, Malfoy, Diggory or another character I will not mention? I honestly have no clue. I have to say I am torn here which is why this lands in the middle for me. There are portions of this...conversations between our characters that have absolutely nothing to do with the story at all which are shear perfection. Unbelievable passages and love which for me was so in keeping with the love I felt during the original books. And yet there are other parts which seemed disjointed and off from what I know. This is written as a play and while at times I felt so much was missing it was also quite intriging. I would love to see this played out on stage. In the end this averages to about a 3.5...which I guess is probably where I would land. Should you expect Book #8 of Harry Potter...no. But for the glimpses and exchanges between these beloved characters it is worth the journey for sure. I love these characters and they will forever hold a special place in my heart. I highly recommend this harry potter its full of fun exciting twists and thrills. Meh. Can't say I was overly impressed by this book. It just seemed like a little much, and rather unnecessary. Book Description "The Eighth Story. Nineteen Years Later. Based on an original new story by J.K. Rowling, Jack Thorne and John Tiffany, a new play by Jack Thorne, Harry Potter and the Cursed Child is the eighth story in the Harry Potter series and the first official Harry Potter story to be presented on stage. The play will receive its world premiere in London's West End on July 30, 2016. It was always difficult being Harry Potter and it isn't much easier now that he is an overworked employee of the Ministry of Magic, a husband and father of three school-age children. While Harry grapples with a past that refuses to stay where it belongs, his youngest son Albus must struggle with the weight of a family legacy he never wanted. As past and present fuse ominously, both father and son learn the uncomfortable truth: sometimes, darkness comes from unexpected places." Though undoubtedly better on stage, J.K. Rowling's latest venture to expand the Wizarding World is still a fabulous fan letter to a generation now facing the challenges of adulthood after growing up with Harry. I enjoyed this script more than I thought I would. I like the fact that it adds another dimension to the already multi-dimensional world J.K. Rowling has created with Harry Potter. Reading a script set in the wizarding world rather than a detailed book (like books 1-7) took some getting used to, but after conquering this hurdle I thoroughly enjoyed reading this play. It is an easy read. I read most of it in one day. I struggled while reading this screen play. I was overly excited for it to come out but was very disappointed. I struggled to see this as a sequel to the original series. Simply because something has a similar topic, does not make it as good as the original. I liked the suspense and plot twists as I was reading but did not enjoy them after I finished the book. I found them hard to believe. It did not fit with the complicated characters and development from the original series and anything that has been published after the fact. I would use this book to teach authors choice as well as exploring screenplays with my students. It's a great screen play and show the progression between multiple years in such a short amount of time. With the newest installment of the infamous Harry Potter franchise, J.K. Rowling introduces the eigth story, nineteen years later with "Harry Potter and the Cursed Child". Years after the Battle of Hogwarts, audiences return to the wizarding world with this newly script-style text where readers can dive into a theatrical performance and perspective of the characters we have all come to know and love in a new and mature way. The story begins with a continuation of the final Potter scene at Platform 9 3/4 of "Harry Potter and the Deathly Hollows" where we left Harry, Ron, Hermoine, Ginny, and Draco being seen sending off their children for their very first year at Hogwarts School of Witchcraft and Wizardry. In this play, audiences take a look at young lives of the offspring of our favorite leading characters and the new journey they embark in during their time as Hogwarts students. The story focuses on Harry's second child, his son, Albus Severus Potter and his struggle of finding his own place in the wizarding world. Albus defines Hogwarts as a place unlike the safehaven like his father did, but more as an atmosphere of being overshadowed by his father's infamous reputation. Feeling much pressure by everyone's expectations of being the child of Harry Potter, Albus defies the social norms of being what everyone wants him to be, and instead sets off on his own journey. Creating new friendships along the way, Albus follows what he believe's is right, no matter what people have to say about it. Based on this book, readers will develop the understanding that the coming of age of a young adult is something that is truly vulnerable and you can't expect a person to fit into any sort of mold that an individual or society creates for you. Lessons for this book would include focusing on perspective and narrative writing and portraying such writing forms in various styles, including screenplays, scripts, and diaries. 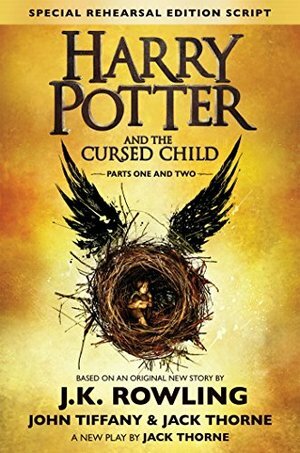 "Harry Potter and the Cursed Child" is an excellent read for anyone who loves the Harry Potter series. With the return of beloved characters 19 years later, the play tells the story of the next generation of Hogwarts students that happen to be the children of Harry Potter, Hermonie Granger, Ron Weasley, Genny Weasley, and Draco Malfoy. Different from the other novels, this is written as a play, consisting of two acts. With this new layout, readers who love plays will have an easy time reading this play. However, it may be confusing to some readers who struggle with plays as their are many scenes in which consist of flashbacks and traveling back in time, making it difficult to keep track of the events that occur throughout the novel. However, I thought that it was a great addition to the Harry Potter franchise as it brought me back to the Wizarding World. With new characters, plot, layout, and themes, "Harry Potter and the Cursed Child" was very enjoyable and was an easy read. What I learned from reading this play is the theme, be happy with what you have. In the play the main character, Albus Potter, is unhappy with living up to the reputation that his father, Harry, has set for him. With using time turners to travel back in time to stop the death of Cedric Diggory, it causes ripples into the present. With drastic changes to the present, Albus finds himself constantly traveling back in time to fix his mistakes and bring the present back to it's normal state. I would teach this play if I wanted to introduce students to the format of a play and to the literary device of flashbacks. With constant use of flashbacks throughout the play, it is a good piece of literature that clearly represents it in mostly every scene. A gift, another Harry Potter book after all these years. A moment to be shared between generations, much like the story itself, as parents can see the passion for Hogwarts spreading to their sons and daughters, just like it originated for themselves years before. There are only a few times in life that an event seems to blend time and space like I have seen with this book release. Parents seeing images of their younger selves, in the checkout line, clutching what was then copies of Goblet of Fire, blending into the current image of their children dancing with anticipation holding Cursed Child. At least that is the way that I figured it was happening for people, my son was completely oblivious to the book release, and was more interested in finding out if he could advance order the next Riordan book. Beyond my fanboy glee at seeing another edition in the Tales of Hogwarts, I was mildly annoyed to see it maintained its scripted format versus an adapted novelization format. After 5 minutes of reading, I no longer cared as I was entranced in the story, and dreaming of what the Sorting Hat would have said about me. The story introduces us to the Potter, Weasley, and Malfoy children picking up right at the end scene from Deathly Hallows. Similar to the originals, whenever the families got together, mischief ensues. I loved seeing the development of new friendships and first crushes. Harry Potter goes from superhero of the world to one of the bumbling adults in a character development arc that brought tears and laughter. Hermione and Ron are still awkward with each other. Ginny has taken over the role of worried mother. I would love to see more stories about them, but it seems that Rowling is done with the storyline. It wouldn’t even be fair to rate the book. I can’t remain objective when reading about some of my most beloved characters. I wouldn’t even bother with “recommend” for this one, make it a MUST read.